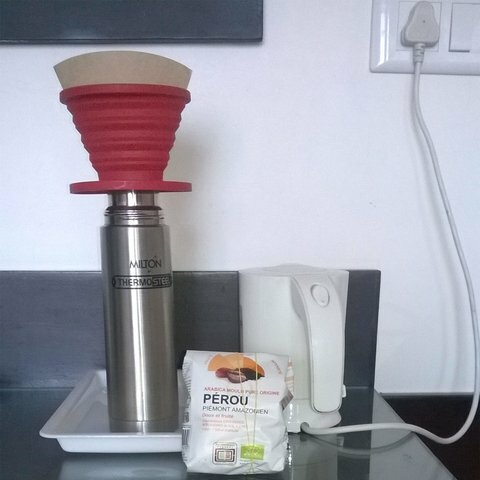 I am in Rishikesh and looking for Arabica coffee cause I make my own coffee filter everyday (I brought 4 packs of 250 gr from France but it will not be enough). I found organic Phalada coffee in powder, smooth and bold) but I read somewhere it is Robusta. I have been told that Indian Robusta is probably the best Robusta in the world. Nevertheless I want to keep the Arabica flavour. Do you know some brands? And in which kind of shop I can find them? Go to Cafe coffee day near chotiwala and buy their packed Arabica roasted coffee powder, it is good. You can also check the grocery store near you, many of them have what you want, or they will procure it in a couple of hours. Even in tiny remote Leh, for the foreign tourist business a few shops sell real coffee. Dewan's is Indian so probably robusta, but Lavazza is also available. And I've bought coffee powder from Cafe Coffee Day before and it was fine. Some people are worshipping dollar, you may consider I worship coffee. In my opinion Nescafé is Nescafé, not coffee. This is not coffee that you prepare with love and approximation: I pour four tea spoons in the filter but maybe a spoon is not so filled than the others; sometimes I pour few more drops of water. I check the colour of the liquid but everyday I drink a new coffee. No sugar, no milk, when I am thinking to this I am shivering like when somebody adds ice in a great whisky or in a good wine. It looks like these people know what is coffee. Nice. Two days ago I went for two scoops of chocolate icecream (really good) and I did not ask for coffee because I considered it is a two small chop (I bought coffee in Panjim five years ago in the CCD). So I was wrong. 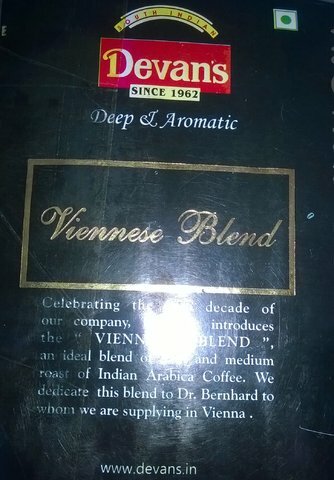 But If you read on my photgraphy, this strong Devan's coffee is an arabica. We are drinking the Dewan's strong since three days. So we can tell you what we feel. We proceeded to a vote (without any influence of Mr Putin). It could be a strong coffee for somebody who is not used to drink black coffee. I don't know how to describe the gustative feeling so I translate direct from French. In the mouth it is little like velvet and the aroma is light (my wife prefer more "fruits" in the coffee). We will give 8 out of 10. Would like to know how you make your brew. In that above photograph I see a funnel , perhaps that houses the filter ? I use a very usual stove top kettle similar to what Bialetti makes , but generic one , using that for last three years or so , only needed to change the gaskets a few times. Would love to try your method. That's simply the continental EU way of making drip coffee. You can purchase a funnel (or an integrated machine, which is less spill-prone), put in a paper filter, add coffee powder and 90 centigrade water, then let gravity do its thing. Personally I prefer the Bialetti method, it comes closest to espresso. thanks for the info. Agree about the virtues of the Bialetti , minus the crema of course. Love the South Indian method too , drip drip all night :D.
Enjoy your 8 out of 10, seems a good result ! dillichaat gave the good answer. This red funnel is made from a kind of plastic in such a way I can make it flat (not taking place in my bag). But you have different other ways to do (with an Italian coffe maker, Turkish way...). Thanks, any ideas for Mumbai?